If this didn't work for you or you want more detailed instructions click here. 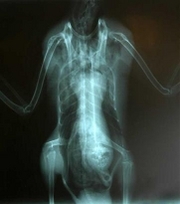 CORDELIA, Calif. - The International Bird Rescue Research Center in Cordelia plans to raise funds with an unusual duck X-ray. The bird came in with a broken wing, but when Marie Travers, assistant manager of the center, radiographed the duck, she was stunned to see a very clear image of what appeared to be the face, or head, of an extraterrestrial alien in the bird's stomach. "Marie looked at it and all she could say was 'unbelievable,'" said Karen Benzel, public affairs director for the rescue center, which has been rescuing sick and injured birds for more than three decades. Unfortunately, the duck died quickly and quietly of its injuries. Initial reports from the center claimed the cause of the alien face was never determined, but Benzel said she was still awaiting results of a necropsy. Either way, the center has come up with a way to turn its alien encounter into a fundraiser for the center. It will auction off the X-ray on eBay. The one-of-a-kind image, which measures 17-by-14 inches, will be sold along with a certificate of authenticity. All proceeds will go toward funding the center's rehabilitation programs.